Occasionally I will decide that a recipe I love...that I have been making for years...needs to be changed. I actually think it would be odd if this didn't happen now and then. I'm always learning new techniques...and picking up new ideas—and I want to apply these things to old favorites. Sometimes a revision is called for simply because my tastes have changed. The fact that I revamp a recipe doesn't necessarily mean the old/original version was bad...it just means I've found a way to make it even better. 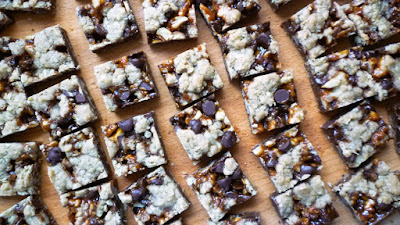 I share all this because the cookie I am posting today—Chocolate Caramel Bars—has been part of a Christmas cookie class that I have been teaching for 10 years. I taught it again last week...and included the "old" version in the class. I had decided to try my hand at reworking the recipe the weekend before the class and just didn't have it ready in time. But it is ready now. If you have the old version, you already know they are seriously delicious. 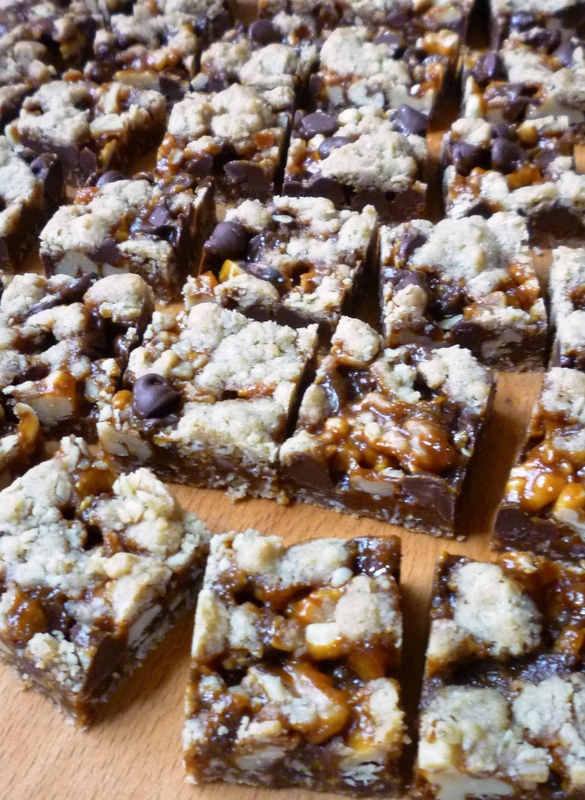 (Early on, these cookies were christened "Danger Bars" by a friend. Rich as they are, it is difficult to limit yourself to one...or two...) You might wonder how they could possibly be better. Well... this version has more caramel (just a bit...). And... the caramel is slightly softer (but still slices neatly and cleanly). The softness comes from the addition of a touch of honey, which adds to the flavor as well (making them reminiscent of my favorite recipe for caramels). The crust is still chewy...but not at all hard.... 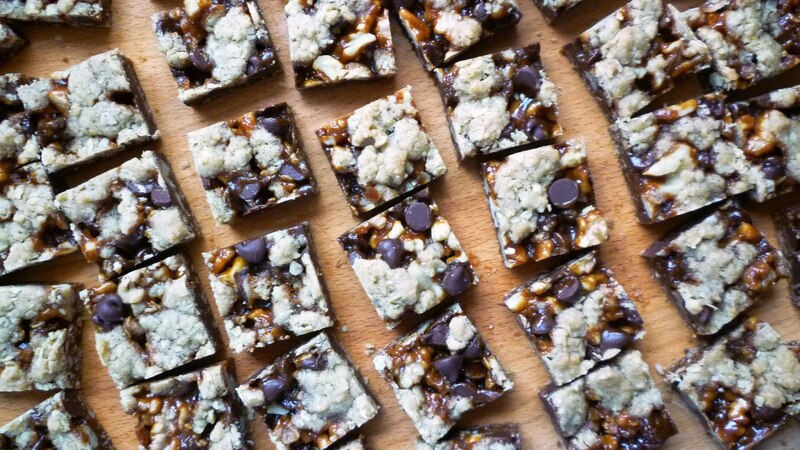 They are just what I wanted when I set out to revise the recipe: a cookie bar in which all the good things about the old are even better. 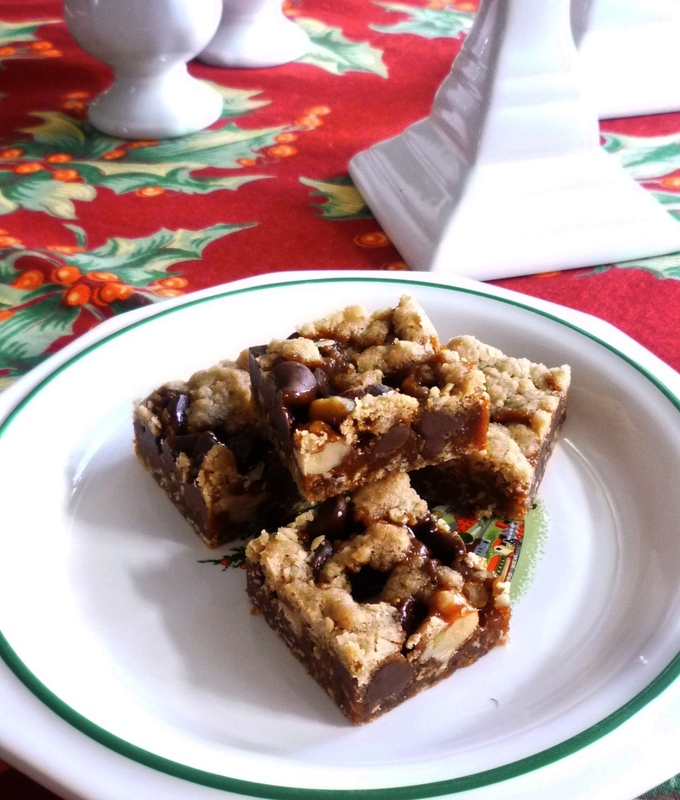 For those of you who have never had my Christmas cookie class: If you like caramel...and chocolate...and nuts...and crunchy-chewy oatmeal crumble, you will love this cookie. It is almost more of a candy bar than a cookie. And like the original it is dangerously and addictively delicious (only more so...). A batch makes a great gift (they are sturdy enough to ship). If you make them, I think you will find they are wonderful the day they are made...and even better the day after. In fact, they just seem to keep getting better with age. How long these cookies will keep I really can't say... They never seem to hang around for long. 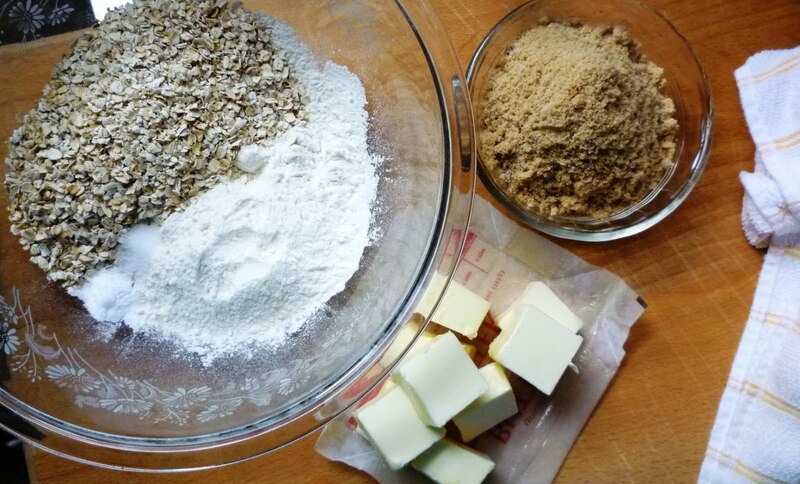 Combine the flour, oats, baking soda and salt; set aside. Cream butter and sugar just until smooth. 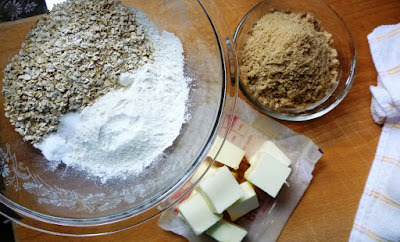 Stir in the dry ingredients just until the mixture is homogenous and crumbly/clumpy. 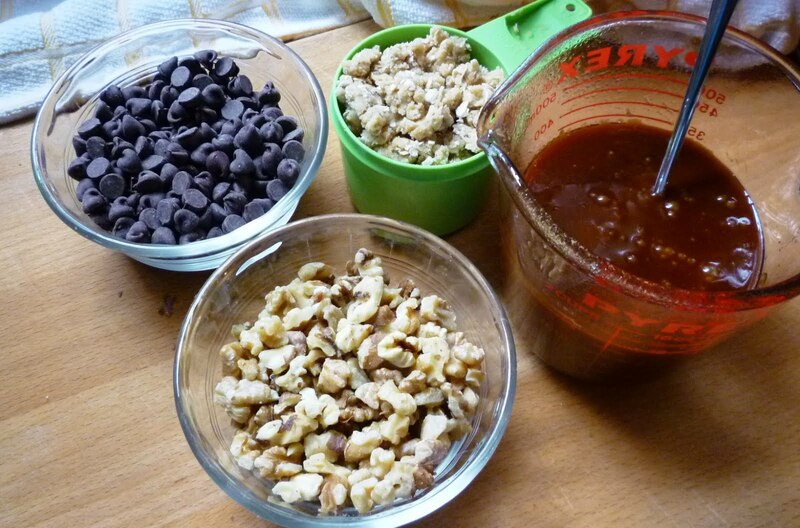 Scoop out 1 cup of the “crumbles” (140 g.) and set aside. Butter a 13x9-inch baking pan—focusing mainly on the sides. Line the bottom of the pan with a rectangle of parchment (don't butter the parchment). Press the remaining crumbs of dough into the pan in an even layer. Bake in a 350° oven until set and golden...about 10 to 15 minutes. Remove from the oven and cool for at least 10 minutes. Place the sugar in a heavy medium-sized saucepan. Place the pan over medium-high to high heat. Watch carefully—the sugar will immediately turn to caramel as it melts. Shake the pan occasionally to prevent the melted sugar from burning and to expose more dry sugar to the heat. If the sugar begins to smoke, lower the heat a bit. 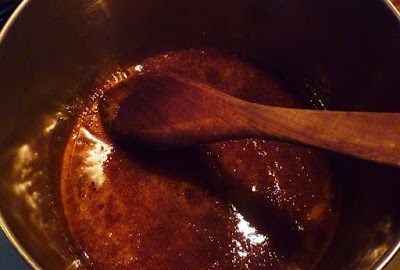 Eventually there will be a few hard lumps of sugar floating in liquid caramel. Remove from the heat and stir until all the lumps are dissolved and the caramel is a clear golden amber—returning the pan to the heat briefly if the lumps don’t dissolve. This whole process will take less than 5 minutes. Off the heat, add the butter, stirring until incorporated. Slowly pour in the cream while stirring with a long-handled wooden spoon (be very careful when adding the cream and butter as the caramel will sputter and boil vigorously). Add the honey. 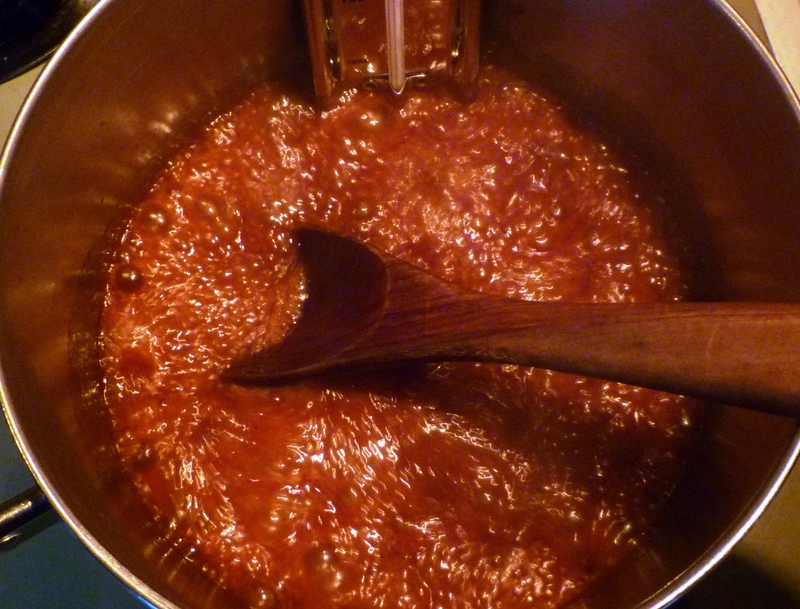 Return the pan to the heat and boil over medium-high heat until the caramel reaches 238° (soft ball stage). Working quickly, remove the pan from the heat and stir in the vanilla and salt. Immediately pour the hot caramel into a greased, heatproof 2-cup measuring cup. You should have 1 1/2 cups of caramel. Let the caramel cool for 10 minutes. You may use the caramel immediately, or let it sit up to an hour at room temperature (warm the caramel slightly before using if it is no longer pourable). Pour the caramel evenly over the cooled crust. Scatter the walnuts, chocolate chunks and reserved crumbs of dough evenly over the caramel. Return to the oven and bake until the caramel is bubbling—about 20 to 22 minutes. or 64 1x1½-inch bars. Place the bars on 2 or 3 layers of paper towels for at least 15 minutes to absorb excess butter before storing air tight between layers of waxed paper. Love these. They are dangerous for me. ;) Here to make your nut brittle, must take it to family on Christmas Eve.